It is vitally important for journalists to understand the fundamental mechanics of the law while on the ground, so they can be aware of when their actions risk arrest. 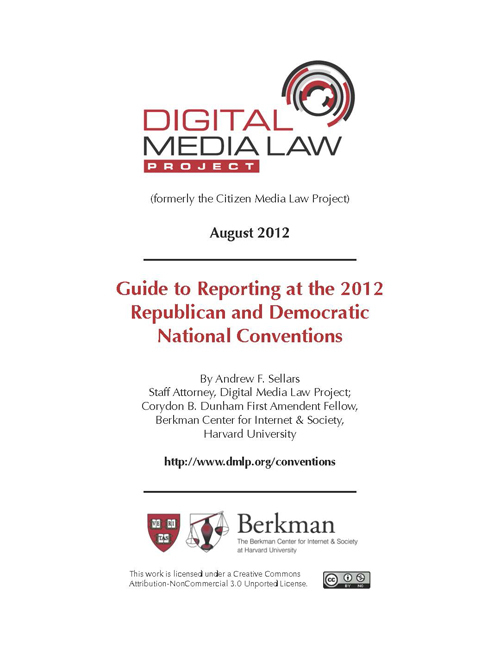 To that end, we have provided this guide as an overview of the various legal issues presented at the RNC and DNC. Topics in the guide include an overview of basic press freedoms, a discussion of what pack in order to prepare for the situation on the ground, information as to how crowd assembly and speech is regulated (so a journalist can be aware of when police may take action against a crowd of demonstrators), laws related to recording in public, a walkthrough on how to react to interactions with the police, and a review on how your rights change when you are reporting on private land. The guide covers the law in both Tampa and Charlotte as it exists today, with helpful information drawn in from reports on past conventions. The guide is designed to allow the reader to engage at whatever the depth he or she needs. You can review the entire document, or turn to the a summary section at the front and refer to the main text as you like; readers can engage at whatever depth they need. (There's even a one-sheet printout for those that just want to have something to reference while on the ground in Tampa and Charlotte.) We have tried to make the law as clear as it can be, and noted how the police have handled enforcing the law at previous conventions, and where journalists ran into trouble. The guide is licensed under a Creative Commons Attribution Non-Commercial 3.0 Unported license, so please feel free to copy, print, re-post, circulate, and share this guide with anyone planning on reporting from the conventions, or studying issues related to press treatment at the conventions. As part of the release of this guide, I will be appearing on a special webcast this evening at 8pm ET, talking about our research, along with Josh Stearns at Free Press, Natasha Lennard at the International News Safety Institute, Mickey Osterreicher at the National Press Photographers Association, and Susie Cagle, an independent journalist and artist with experience with police encounters. Please feel free to join; the webcast is interactive and we will be taking questions and comments from all who choose to participate. I certainly did not act alone in pulling this thing together. A big thank you is due to Jeff Hermes, David Ardia, Josh Stearns, Dalia Topelson, and Kit Walsh, and, of course, to our crack DMLP interns: Kristin Bergman, Lauren Campbell, Tabitha Messick, Natalie Nicol, and John Sharkey. Andy Sellars is the DMLP Staff Attorney, and the Corydon B. Dunham First Amendment Fellow at the Berkman Center for Internet & Society.